Whether you are an active follower of the IZOD IndyCar Series, fan of any other form of motorsport or just a human being concerned for the health and welfare of automotive speed demons, this past Sunday's race on a Houston, Texas street circuit contained a occurrence we hated to see. On the final lap for race #2 of the Pennzoil Grand Prix of Houston race weekend, a freak but serious crash put the lives of drivers and spectators at risk. Impacting the rear of Takuma Sato's vehicle, Dario Franchitti #10 car owned by Chip Ganassi Racing was launched violently into the track fencing. The heavy hit into the temporary caging barely retained the Honda-powered Dallara race car as Franchitti was whipped around multiple times. The #10 car settled on within a sea of debris that showered the track as well as an unfortunate crowd of people observing the Houston IndyCar event. Not without concern for the several spectators who required medical attention following the incident, drivers, teams and many fans were tensely watching the remains of the vehicle belonging to the four-time IZOD IndyCar champion driving for Target Chip Ganassi Racing. Team owner Chip Ganassi (himself a former race car driver) quickly jumped on his motor scooter racing to the crash scene with immense concern for his driver. While head movement was observed with Dario Franchitti, the greatest relief came several minutes later when reports stated the Scottish athlete was awake and alert. Thanks to safety systems built into the Dallara chassis, the massive collision preserved the life of Dario Franchitti. Injuries to others outside of the race competition also proved non-fatal allowing for some relief. The memories of 2011 Indianapolis 500 winner Dan Wheldon's fatal crash at Las Vegas is still a memory of an occasion no one wants to live again. Alive and talking, worry focused on potential injury to Dario Franchitti. Indeed, the Scot described pain to his back and ankle as he once carefully lifted from his car to an Ambulance. At a Houston hospital, Franchitti was diagnosed with a broken right ankle, two spinal fractures and a concussion following the wreck. Well wishes for the three-time Indy 500 winner have come from fans and fellow competitors eager to see the driver return to his race car. With reports on Wednesday Franchitti will require a second surgery for his ankle, the business of motorsports required Chip Ganassi to select a replacement driver for the #10 machine as the final 2013 IZOD IndyCar round at Auto Club Speedway in Fontana, California is set for October 19th. Wednesday afternoon, Target Chip Ganassi Racing named Canadian Alex Tagiani as the fill-in driver for the #10 team. 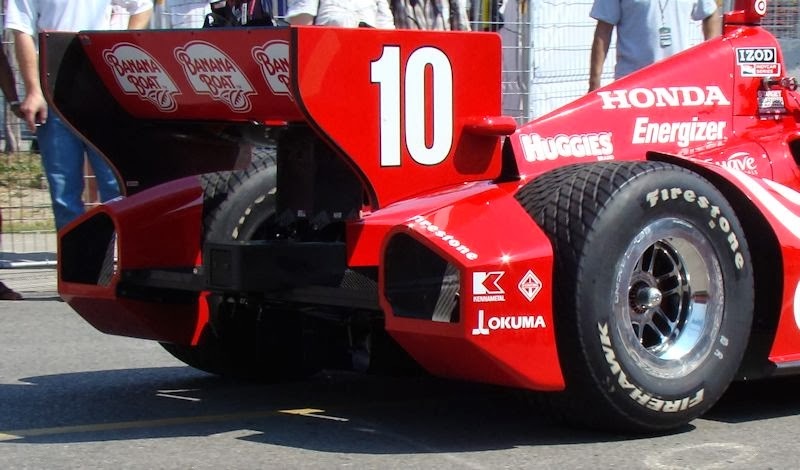 A product of the Players Driver Development Program that operated for promoting Canadian drivers in the 1990s , the 14-year veteran of major open wheel racing brings a lot of experience to the #10 Dallara-Honda. 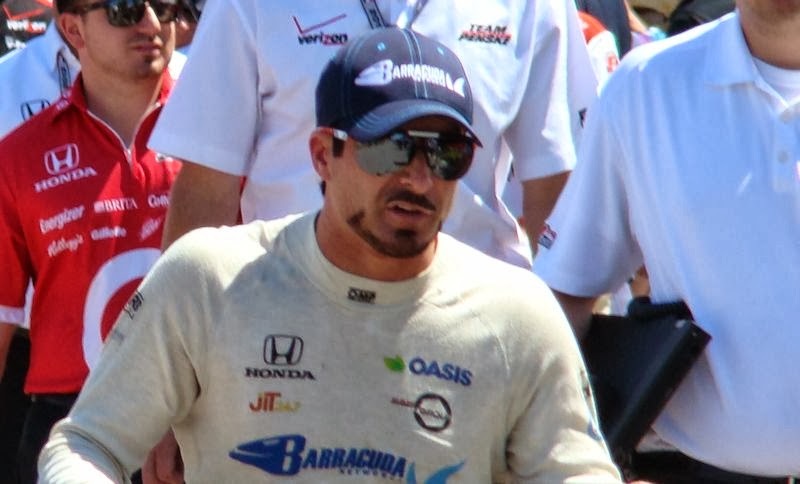 Tagliani's racing resume includes a Champ Car series win at the 2004 Road America round, 2009 Indy 500 Rookie of the Year and a pole position at the 2011 Indy 500. “As a driver you never want an opportunity like this to come under these circumstances, but I’m up for the challenge and looking forward to working with my friend Scott and the whole Target team. I’m thinking of Dario as everyone else is, and wishing him a quick recovery. This team has a championship on the line and I’m ready to step in a help them win it.”, said Alex Tagliani in a team release. Chip Ganassi voiced, “Obviously the situation is not ideal with Dario being unable to compete in Fontana. As we look to the season finale we needed a driver with experience and the ability to step in and get the job done in the No. 10 car, and Alex was a logical choice for us”. Alex Tagliani has been a free agent since the conclusion of the 2013 Honda Indy Toronto race weekend in July. Starting his CART career with Players Forsythe Racing, Alex Tagliani has driven for Rocketsports Racing as well as Team Australia co-owned by Derrick Walker (the current IndyCar Series President of operations and competition). Joining the IndyCar Series on a regular basis in 2010 as part-owner of the FAZZT Race Team, the #77 vehicle fought with limited success against the superteams of Team Penske, Andretti Autosport and Target Chip Ganassi Racing. Tagliani and the FAZZT Race Team owners were bought out by Sam Schmidt in 2011. Sticking with Alex Tagliani for most of the season, the Canadian was released late in the season. In 2012, Tagliani landed at Bryan Herta Autosport driving the #98 car who was pressing forward with its first full season of competition. Starting off the 2012 IZOD IndyCar campaign with the underpowered Lotus powerplant, results were dismal. A mid-season switch to Honda engines improved results topped by a 5th place finish at the Edmonton Indy. Part of the team for the start of the 2013 season, the effort simply could not improve on their 2012 performance. Alex Tagliani was released once again during the middle of an IZOD IndyCar season. During his hiatus from IndyCar, Tagliani drove a Ferrari 458 Italia GT car in the Grand Am Rolex Sports Car Series. Competing at Auto Club Speedway in the past with CART and the IZOD IndyCar Series, Alex Tagliani's best result at the track is third occurring in 2001 (Tagliani also won the pole position for that event). Last year's race at Auto Club Speedway ended with a late race crash for Tagliani after leading several times. The October 19th MAVTV 500 will end the 2013 IZOD IndyCar Season.